Have you asked yourself the million dollar question “How’s it like in Hell?”, because I sure know the answer now, and it’s not a pretty one (unless you’re into intense pain and suffering, that is). The game Agony Unrated is one of those kind of games that lure you in with exciting, stomach-turning, mind-blowing puzzles (I mean, feed the demon babies to the door hands?) and various characters each with their own story, only to drive you deeper into the abyss. The game follows its own rules, and censorship isn’t one of them. So if you’re sensitive to blood, gore and violence, I suggest you stay as far away from the game as you can, because it’s going to stain your retina in ways you can not imagine (trust me on this one). But on the other hand, if you do like these horror adventures, then welcome to the club (we’re out of cookies tho)! One thing I could say about the gameplay that just doesn’t do it for me, is the first-person perspective. I do get where it’s coming from, the purpose that it has, to put you exactly into the character’s skin, to experience everything as the character himself, all the dialogues and interactions, but I just find it off-putting. For real. As a puzzle addict that I consider myself to be, I like to see things from a broader perspective and analyze all possibilities before diving head first into the action. In Agony Unrated I found myself going back and forth like a headless chicken thinking “what am i doing here?” when everything was kinda clear now that I think about it (but being in that hell-ish environment makes it harder to think clear through all the screams and so, you know). In the game you play as a mortal being who made a pact with the devil and ended up in Hell. You will interact with several other humans who now reside there and probably have done the same as you. Unlike them, you have a set goal, and that is to find the Red Lady. Through all the puzzles and trials you have to go to get to her, you will find artifacts and collectibles that unlock extras, so keep an eye out for these. Also, as referenced in the Bible, you will find forbidden fruits which will make you stronger (and yes, they DO look like that). All things considered, if you’re curious about the story (which is quite an interesting one BTW), about how the actual devil looks like and if you can put aside all the sexual references combined with religion, you should definitely have a blast playing Agony Unrated. The Bible quotations in the game give it some sort of mysterious aura which in a way is tied to the events in the game. These, along with the notes you find throughout the game, relate the story of the game in morbidly vivid detail. As for the sounds of the hellish world, you should expect the usual screaming, begging for mercy and forgiveness and lots and lots of gross squishy sounds. If that is not enough to project you into this world, then turn the volume up because this game sounds exactly as it is supposed to do. Even if some animations and cut-scenes in dialogues are a little weird and abrupt, the overall experience is a good one because the environment’s graphic is making up for all the minuses in the character animations. In a way, the game reminds me of Dishonored. It has a set objective, a first person perspective and the ability to improve skills in game. That, and the dark environment bring to life all the graphic details put in the making of it. However, it can be a little overwhelming when it comes down to gameplay, because it is not the best, as I mentioned before. To download the game, check Agony Unrated on Steam. 8.8 Awesome! 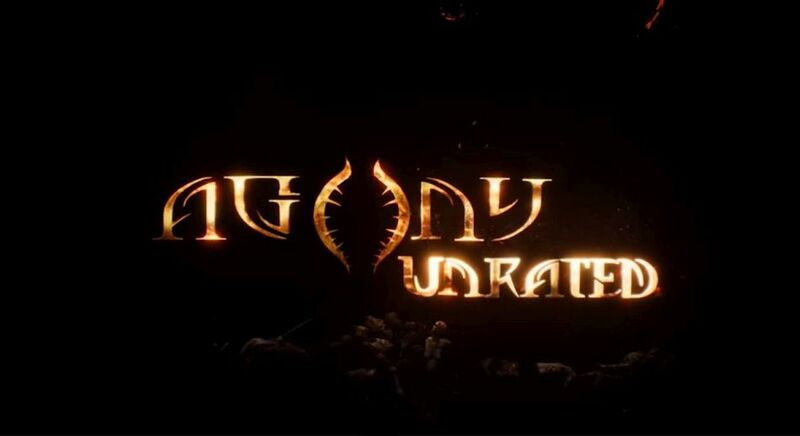 Agony Unrated is a great game for the adventure seekers. With good graphics that place you exactly where you need to be in the environment, if you can get past the average gameplay experience, you'll definitely enjoy the game.